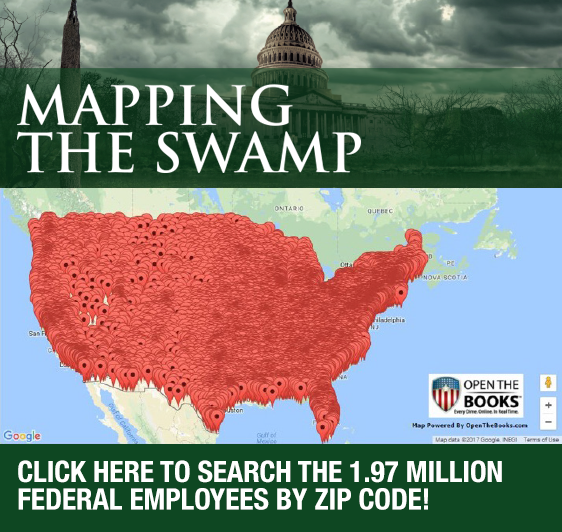 “People are really hungry for these hard facts, they are interested in searching their little piece of the swamp,” Andrzejewski told The Daily Signal. —A small federal agency in San Francisco, Presidio Trust, paid out three of the government’s four largest bonuses, including the largest in fiscal year 2016. The biggest bonus, $141,525, went to a personnel manager who did payroll. —The Postal Service and the Department of Veterans Affairs employ over half of all disclosed federal workers, at 32 percent of and 19 percent, respectively. —About 2 million “undisclosed” employees work for the Defense Department, including active military duty. Their compensation, including $1 billion in bonuses and $125 billion in pensions, amounts to $221 billion per year. Federal workers are paid a “new minimum wage,” Open the Books argues, because the average employee at 78 of the 122 departments and independent agencies reviewed makes $100,000 or more.